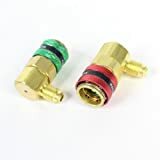 Car A/C R134a QC-12A Quick Connector Adapter Coupler Green Red x 2 , selling for $21.19 brand new. Manufactured by uxcell. There are 1 units left brand new. The quick coupler adapter can be divided into high pressure (red) or low pressure (blue) . It can be connected with hoses quickly and easily.This coupler offers you the best convenience to attach the manifold hoses onto the Auto/Car AC R134a system during the diagnosis, charging or evacuation working.